The Evangelical Christians I have met in the United States often talk about how reading the Bible changed their lives. They talk about being born again. I am not an Evangelical Christian. I am a Chinese atheist who came to the West to study at the world’s best universities and, later, to work at one of capitalism’s greatest companies, Goldman Sachs. But, like the Evangelical Christians, my life was changed by a book. Specifically, Robert Rubin’s autobiography In an Uncertain World (Random House, 2003). Robert Rubin was Goldman Sachs’s senior partner and subsequently secretary of the Treasury. Only later did I learn that certain people in the United States revere him as something of a god. I first bought the book because I was puzzled by the title, especially coming from a man who had achieved so much. I had always thought that things happen for reasons. My parents taught me that good people get rewarded while evil gets punished. My teachers at school taught me that if you work hard, you will succeed, and if you never try, you will surely fail. When I picked up the book, I was studying math at Cambridge University and, as I looked back at the standardized tests and intense study that had defined my life until then, I could see no uncertainty. But since reading Rubin’s book, I have come to see the world differently. Robert Rubin never intended to become the senior partner of Goldman Sachs: a few years into his career, he even handed in his resignation. Just as in Rubin’s career, I find that maybe randomness is not merely the noise but the dominant factor. And those reasons we assign to historical events are often just ex post rationalizations. As rising generations are taught the rationalizations, they conclude that things always happen for a reason. Meanwhile, I keep wondering: is there someone, sitting in a comfortable chair somewhere, flipping a coin from time to time, deciding what happens in the world? Most Americans that I have met seem confused about this question. Perhaps it is understandable since most of them are not in finance and have not read Rubin’s book. Their goal is always to change something—Stanford business school’s motto is “change lives, change organizations, change the world”—though they rarely seem to know what or how. Or what the role of chance and circumstance is. But if the goal is to change something, they must have the ability to determine the future, mustn’t they? The great American dream itself is a determination to take control of one’s own destiny and live an extraordinary life from an ordinary background. Yet how is this possible in Rubin’s uncertain world? Three years later, I graduated with first class honors and got a job offer from Goldman’s Fixed Income, Currency and Commodity division, the division founded by my hero Rubin. It seemed like whatever I wished would simply come true. But inside, I feared that one day these glories would pass. After all, not long ago, I was at the bottom of my class in China. And if I could not even catch up with my classmates in a city few people have even heard of, how am I now qualified to go to Cambridge University or Goldman? Have I gotten smarter? Or is it just that British people are stupider than the Chinese? With these mixed thoughts, I began working as a trader at Goldman in 2007. Goldman’s unofficial motto is “be long-term greedy.” I found that my Goldman colleagues were very smart and competitive. However, I actually didn’t see much of the “long-term” part of the “long-term greedy” culture. Goldman Sachs, even with its reputation as the top investment bank, has been involved in scandals in mortgage products, trades with the Greek government, its links with Malaysia’s corrupt 1MDB, and so on. Maybe this is due to the fact that Goldman is now a public company with a quarterly earnings call. Maybe it is because the position of the trading desk where I worked was marked to market in real time. When you see the number change in front of you from second to second—and especially when that number is not going in the right direction—even one day can feel like eternity. That tells you how long-term oriented traders are in general. My job at Goldman was a mixture of making markets to facilitate client trades and finding trades for the bank’s own book. In early 2009, I believed it was an excellent trade to go long UK inflation. In fact, I thought it was such a good trade that my biggest worry was that there wouldn’t be anyone who would want to be on the other side of it. Yet we managed to put this trade on versus a British bank. In the following year, the trade worked wonders, with UK inflation steadily rising, making the bank tens of millions in profits. I thought I was an amazing trader. But there was a slight problem: I wanted to do the trade because I thought the market was pricing UK interest rates to go up. And when interest rates go up, UK inflation would rise mechanically due to the way it is defined and calculated. But in that year, the Bank of England didn’t raise interest rates at all. Rather, the increase in inflation was due to things like tax increases, exchange rate fluctuations, oil price moves, etc.—things I didn’t anticipate at all. It was pure luck that I made money, and I made it for the wrong reason. When I was an intern, in one of the training presentations, a senior banker told us to distinguish between the process and the results. He said that we should focus on the process, which we can control, rather than the result, which is subject to luck. And here at Goldman, he said, we don’t punish people for losing money for the right reason. I have always loved asking questions, so I asked him, was anyone ever punished for making money for the wrong reason? After giving it some thought, he said that he had not heard of any such thing. And he was right. In fact, no one seemed to remember the reason I did the inflation trade at all. They only remembered that I did this trade and that it worked well. When I met with my manager for a performance review after this, I was expecting to be berated for my poor judgment. Instead, I got promoted! I told my manager that it was a mistake, but he merely said, “Puzhong, tell no one.” He too was promoted on the basis of managing my “brilliant” trade. In fact, my manager was so proud of my work he recommended me to Stanford’s prestigious Graduate School of Business (GSB), and I soon set off for America. One thing that I learned at Goldman was that, to rise through the ranks, it was not enough to just be a good trader. It was also essential to be able to manage one’s boss, other colleagues, and those who report to them. I never paid any attention to those things. I hoped to learn about them in business school. In Communism, the future is certain; it is only the past that might not be. A few years ago, I was reading an autobiography of a Chinese girl named Nian, who went to study in the UK when she was young. (Someone once said that it is necessary to know English in order to learn about China. Important perspectives on China are only available in English and are generally not accessible on the mainland.) She studied at the London School of Economics and met her husband. After graduation, Nian, her husband, and all their friends went back to China. Her life, up to that point, was very similar to the life that I have been living. And I am sure that, at the time, she was as optimistic about her life as we are today about ours. But she went to the UK in 1935, and she went back to China around the founding of the People’s Republic of China. Her education abroad, in a capitalist country, and her belief in individual rights and freedom often placed her on the wrong side of various political campaigns and the Cultural Revolution. She lost numerous friends and family members, including her husband and daughter during these years. She barely survived a long period of imprisonment herself. It was not until the 1980s when she managed to get a passport and could move to live with her relatives abroad. On the ship to Hong Kong, she kept thinking about her decision to return to China all those years ago. As I finished her story, I kept thinking about the similarities and differences between Nian’s life and my own. What would have happened to her if she was living in the present time, or what would happen to me if I had been born seventy years earlier? What I realized is that if we look at one individual’s life in isolation, it is very tempting to come to the conclusion that one’s particular actions lead to whatever happens next. But if we look at the society as a whole or look across generations, we can see that people with very similar backgrounds can take similar actions and end up with vastly different results. Yet one wonders how long such luck will last. This brings me back to the title of Rubin’s book, his “uncertain world.” In such a world, the vast majority things are outside our control, determined by God or luck. After we have given our best and once the final card is drawn, we should neither become too excited by what we have achieved nor too depressed by what we failed to achieve. We should simply acknowledge the result and move on. Maybe this is the key to a happy life. On the other hand, it seems odd that this should be the principal lesson of a Western education. In Communist China, I was taught that hard work would bring success. In the land of the American dream, I learned that success comes through good luck, the right slogans, and monitoring your own—and others’—emotions. 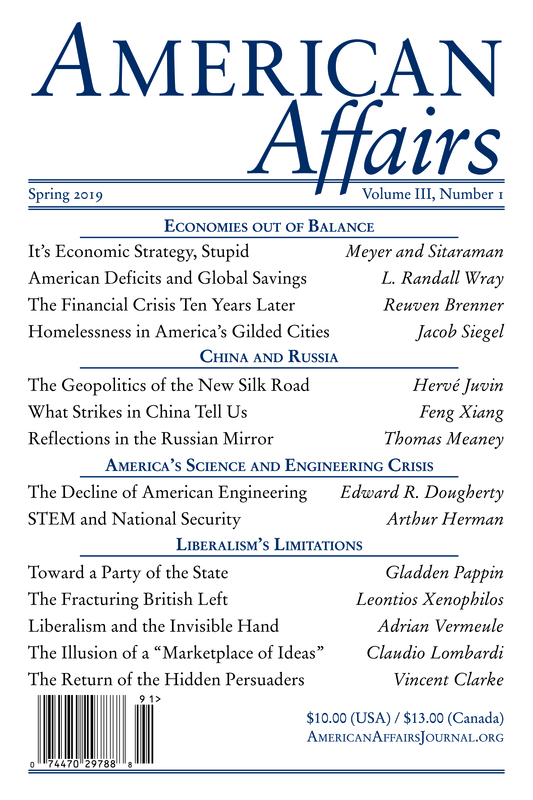 This article originally appeared in American Affairs Volume I, Number 4 (Winter 2017): 77–86. Puzhong Yao is the director of a private investment vehicle. He graduated with first class honors from Trinity College, University of Cambridge, and received an MBA from the Stanford Graduate School of Business. Previously, he worked at Goldman Sachs and Capula Investment Management.